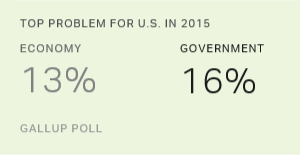 PRINCETON, N.J. -- For the second consecutive year, dissatisfaction with government edged out the economy as the problem more Americans identified as the nation's top problem in 2015. 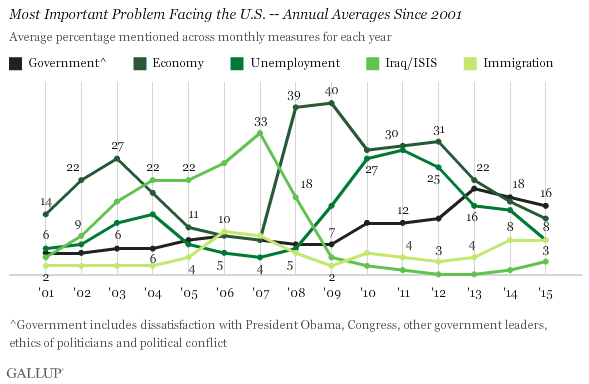 According to Gallup's monthly measure of the most important problem facing the U.S., an average of 16% of Americans in 2015 mentioned some aspect of government, including President Barack Obama, Congress or political conflict, as the country's chief problem. The economy came in second with 13% mentioning it, while unemployment and immigration tied for third at 8%. Although the economy and unemployment both made the top four this year, the average percentages mentioning them are down from 2014 and well below the levels recorded from 2009 through 2013. Notably, 2015 was the first year since 2007 in which immigration was one of the top four most frequently cited problems, although this is mainly because mentions of healthcare dropped from 10% in 2014 to 6% in 2015, making room for immigration at the top. Mentions of immigration held steady in 2015 at 8%. 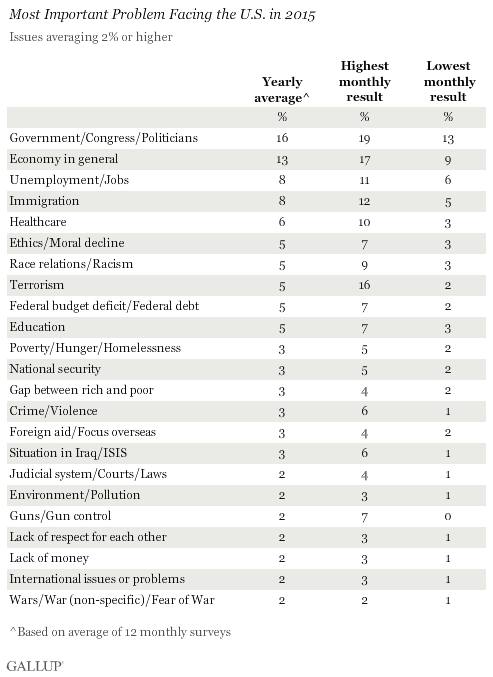 Rounding out the top 10 were a constellation of problems each averaging 5%, including ethical/moral decline, race relations/racism, terrorism, the federal budget deficit or debt and education. 2015 marks only the second time since 2001 that no single issue averaged 20% or more for the year. 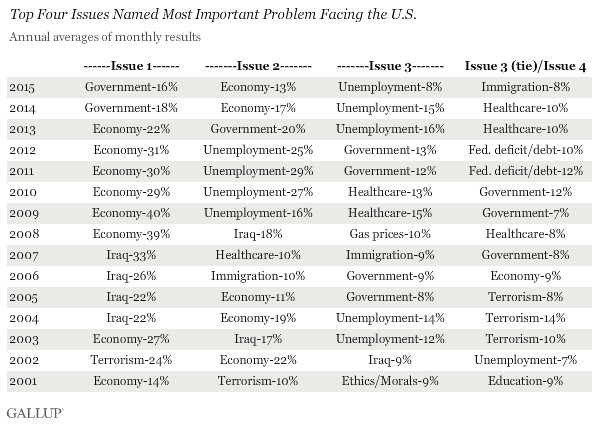 However, 34% of Americans named at least one of several specific economic issues -- including the economy, unemployment, the budget deficit, inflation and others. Although mentions of terrorism averaged just 5% for the year, the percentage of Americans citing it spiked to 16% in December following the terrorist attacks in Paris and the San Bernardino shooting in which two individuals killed 14 people. Earlier in the year, terrorism rose as a concern to 8% following the Charlie Hebdo attack in Paris, which al Qaeda in the Arabian Peninsula claims to have orchestrated. Otherwise, monthly mentions of terrorism were mostly in the 2% to 4% range throughout the year. Another issue that briefly spiked as a concern in 2015 was gun control, with mentions rising from near 1% most months to 7% in October and December following mass shootings that dominated the news. Similarly, mentions of immigration rose above 10% in September, possibly reflecting Americans' concerns about the European migrant crisis, or in response to the publicity that the Republican presidential debates gave to Donald Trump's stances against illegal immigration. Mentions of the economy were fairly steady all year near the 13% average rating, but dropped to 9% in December, likely because of the spike in concern that month about terrorism and gun violence. As was the case in each of the two prior years, there was less consensus in 2015 on any single problem as the nation's biggest, largely because Americans' concern about the economy and unemployment subsided, while no other issue replaced them. Americans were most likely to mention some aspect of the federal government in 2015 when asked to name the country's top problem, but this category still averaged less than 20% of all responses during the year. Even when mentions of terrorism, immigration and gun laws briefly flared, the percentages citing these stayed below the 20% threshold.